Newlands School, taken from the air in 1985, looking up Newlands lane to the right, High Street foreground left, and Hawkshead Avenue rear right. Built in a pleasing, deep-red rough-faced brick finish, the school building boasted many 'art-deco' features. Torch-style lamps with fluted glass outside the main doors and ornate surrounding wrought-Iron railings being two that I remember. Further buildings were added in the 1960's. The housing surrounding Newlands school, from which many of its pupils were drawn. Newlands lane snakes its way south, leading onto Westfield Drive, thence Moss-bay. This picture illustrates vividly the contiguousness of the dwellings - from High Street to High Harrington; Newlands Lane and Ashfield becomes Moorclose; Moorclose becomes Westfield; becomes salterbeck; becomes Harrington.... Only the old C & W railway lines demarcate, funneling traffic towards either Moss-Bay road or Brierydale. The history behind Newlands school really began in November 1894, when the Workington Higher Grade, or Higher Standard school was established by the Workington School Board. The premises were in Guard Street, and were formerly used by Wilson's Infants school. The Higher Standard school was originally a mixed school for pupils who had reached a certain level of education in the ordinary elementary schools. It was divided into seperate departments for boys and girls on 12th August 1912, and in 1918 the admission requirements were changed from educational standard to entry on reaching 12 years of age. In 1924 a selective	examination system was introduced, and the schools were re-organised on 18th August that year as Workington Central Boys and Girls schools. A higher and more advanced type of elementary education was thus provided for those children whose parents agreed to keep them school until they reached fifteen years of age, so completing a three-year course. In July 1932, the Central schools moved to new premises in the High Street. Under the Education Act of 1944, the education powers of Workington Borough passed to the Cumberland Local Education Authority. The Central schools were amalgamated on 14th April 1947 as a mixed, non-selective secondary-modern school, and was retitled Newlands School early in 1948. This closed as a mixed school on 21st July 1967, and re-opened after the summer holidays as a girls' school for eleven-to-sixteen year-olds. It remained thus until closure on 13th July 1984, a result of the general re-organisation of secondary education in West Cumbria. And here our school is set. Who come to learning's call. In faith and honour deal. Be all thy children free. Be one as brothers born. Shall thy fair name be hurt. David McCreedy (Ex-Newlands pupil, 1958 - 1960) tells me that the above song was sung to the tune of 'The Minstrel Boy'. 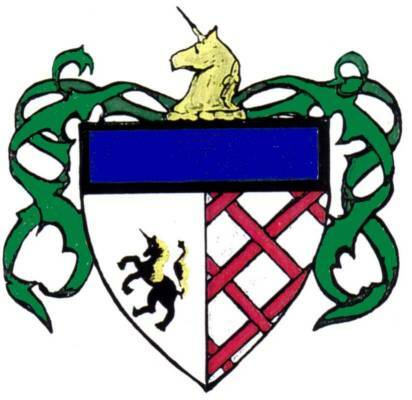 I am indebted to Jeff Wilson, Ex-pupil and local author, for information appertaining to the history of Newlands School, the School Song, and this picture of the Newlands School badge. 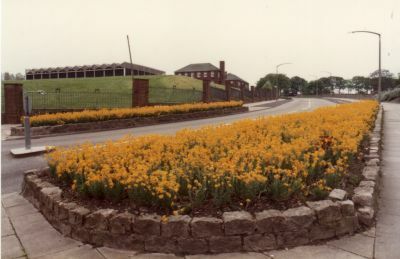 A colourful floral display in the foreground does credit to the council parks dept, behind which can be seen the school gymnasium and boiler-house chimney.